Ronald Alcides Solorsano Torreyes (pronounced tow-RAY-ess)...Instagram: @ronald_torreyes...married to Anarelys and the couple has a son, Moisés. Began season with New York-AL, his third straight Opening Day roster, all with the Yankees...Hit .339 (21-for-62) with six doubles and six RBI in 22 games for the Yankees but struggled to get regular at-bats (Didi Gregorius and Gleyber Torres)...Optioned to Triple-A Scranton/Wilkes-Barre May 25...Placed on the Temporarily Inactive List on June 27 at S/W-B to deal with a family health issue; reinstated July 23 and had option transferred to Single-A Tampa for four games...Promoted back to Scranton/Wilkes-Barre, playing 11 games before being recalled by New York-AL August 13 and spent the rest of season with Yankees...Finished the season hitting .200 (7-for-35) in 17 games for the Yankees in August and September...Combined to hit .265 (56-for-211) with 10 doubles, 16 RBI and 20 runs scored in 71 games at all three levels combined...at all three stops, combined to play 32 games at second base, 18 at shortstop, 17 at third base, and two in leftfield. In 108 games with the Yankees (43 starts at 2B, 26 at SS and 16 at 3B), hit .292 (92-for-315) with 35R, 15 doubles, 1 triple, 3HR and 36RBI…set single-season career highs in games played, runs scored, hits, doubles, homers and RBI…batted .338 (25-for-74) oﬀ left-handers.. With 43 starts at 2B, 26 at SS and 16 at 3B, was one of ﬁve Major Leaguers to make at least 15 starts at each of those positions in 2017 (also the Mets' Asdrubal Cabrera and Jose Reyes, San Diego's Yangervis Solarte and San Francisco/Boston's Eduardo Núñez)…is the ﬁrst Yankee to start 15-or-more games at any three diﬀerent inﬁeld positions in a season since Mike Gallego in 1993 (46 at SS, 41 at 2B, 24 at 3B)... He and Aaron Judge each had 13RBI through the team's ﬁrst 17 games, the most by a Yankee under the age of 25 through 17 team games since Derek Jeter in 1999 (14RBI)... Was the Yankees' starting shortstop on Opening Day... Hit two-run HR-the ﬁrst homer by a Yankee in 2017 and the second HR of his Major League career-in 4/4 win at Tampa Bay…marked the second consecutive year that the Yankees' ﬁrst HR of the season was hit by a shortstop (Didi Gregorius, 4/5/16 vs. Houston-Opening Day)…at 24 years, 214 days old, became second-youngest hitter over the last 20 seasons to hit the Yankees' ﬁrst HR of the season (Melky Cabrera, 23 years, 234 days, on 4/1/08 vs. Toronto)... Collected his ﬁrst career "walk-off" hit with a two-out single in the 10th inning of 6/23 win vs. Texas…was his second career go-ahead RBI in the ninth inning or later (also a tie-breaking SF in the ninth on 9/25/16 at Toronto)... Started 10 straight games from 6/22-7/1 (ﬁve at 2B, four at 3B, one at SS)... Hit a solo HR in 6/25 loss vs. Texas, snapping a streak of 125AB without a homer…had not homered since hitting the Yankees' ﬁrst HR of the season on 4/4 at Tampa Bay…his teammates hit 117HR between his homers... Following the All-Star break, hit .307 (47-for-153) with 16R, 9 doubles, 1HR and 16RBI in 51 games... Hit two-run HR, doubled and had a career-high 3RBI in 7/30 loss vs. Tampa Bay…recorded two extra-base hits in the same game for the third time in his career (also 1 double/1HR on 8/19/16 at Los Angeles-AL and 2 doubles on 8/23/16 at Seattle)…later did so on 9/25 vs. Kansas City... Started in 21 straight games from 8/2-24, batting .315 (23-for-73)... Made the postseason for the ﬁrst time in his career, going 0-for-1 in two games…made his playoﬀ debut in ALDS Game 2 loss at Cleveland. Made his first career Opening Day roster and spent the entire year at the Major League level in his first season with the Yankees, hitting .258 (40-for-155) with 20R, 7 doubles, 4 triples, 1HR and 12RBI in 72 games (27 starts at 3B, 11 at SS, 9 at 2B). In his first three games as a Yankee, went 6-for-9 with 3R and 2RBI…joined Starlin Castro (6H in first 9AB) as the first players with at least 6H in their first 9AB with the Yankees since Cody Ransom (6H in first 9AB) in 2008. Hit .471 (8-for-17) with 3R, 1 double, 1 triple, 2RBI and three multi-hit contests in his first eight games (4/6-26). Made his Yankees debut in 4/6 win vs. Houston, hitting a pinch-hit, two-run triple in the seventh inning…was the second Yankee in as many days with 2RBI in his first at-bat with the team (also Starlin Castro on 4/5)…was just the second pinch-hit triple by a Yankee since 1996 (also Jorge Posada on 4/26/08 at Cleveland). Made his first professional appearance in RF in 4/24 loss vs. Tampa Bay…entering the season, had played in 11 games in LF and 12 in CF (all in the minors). Played in just five games in June (2GS at 2B/1GS at 3B), going 1-for-11. Was defensive replacement at 3B for Alex Rodríguez in 8/12 win vs. Tampa Bay, Rodríguez's final game with the Yankees…entered with one out in the ninth inning. Did not strike out over a 30AB stretch from 8/14-9/3…had a career-high seven-game hitting streak from 8/19-28, batting .538 (14-for-26) with 6R, 6 doubles, 1HR and 4RBI…had just 4XBH in his first 42G of 2016. Hit his first career Major League home run (off Jered Weaver), collected a career-high 4H and scored a career-high 3R in 8/19 win at Los Angeles-AL, going 4-for-5 with 2RBI…became the first Yankee with 4H from the No. 9 spot since Francisco Cervelli on 8/29/10 at Chicago-AL (4-for-4, 1R, 1 double, 1SB) and the first Yankee No. 9 hitter with 4H and at least 1HR since Juan Rivera on 9/27/03 vs. Baltimore (4-for-4, 3R, 2HR, 4RBI)…since 1972, became only the fourth Yankee under the age of 24 to record at least 4H and 1HR in a game (also Gary Sánchez-23y, 252d on 8/10/16 at Boston, Robinson Canó-23y, 317d on 9/4/06 at Kansas City and Derek Jeter-23y, 314d on 5/6/98 at Texas). Saw his first Major League action with the Dodgers, going 2-for-6 (.333) with 1R, 1 double, 1RBI and 1BB in eight games as a September call-up...was recalled from Triple-A Oklahoma City on 9/13...Made his Major League debut in 9/13 win at Arizona, entering as a fifth-inning defensive replacement at 2B...collected his first career hit with double off Randall Delgado in the seventh inning...Spent the majority of the season at the minor league level, combining to hit .261 (109-for-418) with 60R, 18 doubles, 3 triples, 4HR and 36RBI in 110 games with Triple-A Fresno, Double-A New Hampshire, Double-A Tulsa and Triple-A Oklahoma City...In 19 games with Fresno, hit .200 (14-for-70) with 7R and 5RBI...was designated for assignment by Houston on 5/7...was acquired by the Blue Jays from the Astros in exchange for cash considerations on 5/15...Played in 16 games with New Hampshire, hitting .140 (7-for-50) with 4R, 2 doubles and 9RBI...Was acquired by the Dodgers from the Blue Jays in exchange for cash considerations on 6/12...Hit .293 (73-for-249) with 39R, 13 doubles, 4HR and 19RBI in 62 games with Tulsa...in 13 games with Oklahoma City, batted .306 (15-for-49) with 10R, 2 doubles and 3RBI...Was designated for assignment by the Dodgers on 1/7/16...was acquired by the Yankees on 1/12/16 with LHP Tyler Olson from Los Angeles-NL in exchange for INF Rob Segedin and a player to be named later or cash considerations...was designated for assignment on 1/15/16 when the Yankees claimed OF Lane Adams off waivers from Kansas City...was claimed off waivers by Los Angeles-AL on 1/25/16 and designated for assignment by the Angels on 1/27/16...was claimed off waivers by the Yankees from the Angels on 2/1/16. Spent the entire season at the Double A level, hitting a combined .269 (101x375) with 19 doubles, two homers, 37 RBI and a .329 on-base percentage in 103 games between Corpus Christi (38g) and Tennessee (65) of the Cubs organization...was acquired by the Astros from the Cubs in exchange for international pool space on July 2, 2013...was one of the three youngest players in the Texas League after joining Corpus Christi. Played 115 games at Class A Advanced Daytona...entered the year ranked by Baseball America as the Reds No. 13 prospect. Named a Low Class A All-Star by Baseball America in what was his first full season in the United States...hit .356 (99x278) with a .398 OBP in 67 games with Class A Dayton...was traded to the Cubs along with OF Dave Sappelt and LHP Travis Wood in exchange for LHP Sean Marshall on Dec. 23. Started his pro career by playing in a combined 91 games with the Rookie VSL Reds (67g), AZL Reds (18g) and Class A Dayton (6g)...hit .370 (129x349) with 12 doubles, five homers, 46 RBI, 25 stolen bases and a .434 OBP between the three stops. March 27, 2019 Minnesota Twins optioned 2B Ronald Torreyes to Rochester Red Wings. December 6, 2018 Minnesota Twins signed free agent Ronald Torreyes. 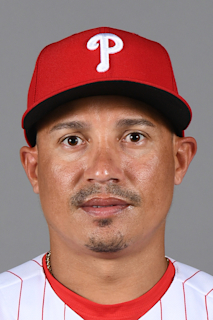 November 30, 2018 2B Ronald Torreyes elected free agency. November 28, 2018 New York Yankees traded 2B Ronald Torreyes to Chicago Cubs for Player To Be Named Later. November 26, 2018 New York Yankees designated 2B Ronald Torreyes for assignment. August 13, 2018 New York Yankees recalled 2B Ronald Torreyes from Scranton/Wilkes-Barre RailRiders. July 30, 2018 2B Ronald Torreyes assigned to Scranton/Wilkes-Barre RailRiders from Tampa Tarpons. July 23, 2018 2B Ronald Torreyes assigned to Tampa Tarpons from Scranton/Wilkes-Barre RailRiders. June 26, 2018 Scranton/Wilkes-Barre RailRiders placed 2B Ronald Torreyes on the temporarily inactive list. June 18, 2018 New York Yankees optioned 2B Ronald Torreyes to Scranton/Wilkes-Barre RailRiders. June 9, 2018 New York Yankees recalled Ronald Torreyes from Scranton/Wilkes-Barre RailRiders. May 26, 2018 New York Yankees optioned 2B Ronald Torreyes to Scranton/Wilkes-Barre RailRiders. February 1, 2016 New York Yankees claimed 3B Ronald Torreyes off waivers from Los Angeles Angels. January 27, 2016 Los Angeles Angels designated SS Ronald Torreyes for assignment. January 25, 2016 Los Angeles Angels claimed SS Ronald Torreyes off waivers from New York Yankees. January 15, 2016 New York Yankees designated SS Ronald Torreyes for assignment. January 12, 2016 Los Angeles Dodgers traded LHP Tyler Olson and SS Ronald Torreyes to New York Yankees for 3B Rob Segedin. January 7, 2016 Los Angeles Dodgers designated SS Ronald Torreyes for assignment. December 17, 2015 SS Ronald Torreyes assigned to Tigres de Aragua. October 16, 2015 Los Angeles Dodgers activated SS Ronald Torreyes. October 9, 2015 Los Angeles Dodgers reassigned SS Ronald Torreyes to the minor leagues. September 13, 2015 Los Angeles Dodgers recalled SS Ronald Torreyes from Oklahoma City Dodgers. August 28, 2015 SS Ronald Torreyes assigned to Oklahoma City Dodgers from Tulsa Drillers. August 15, 2015 SS Ronald Torreyes assigned to Tulsa Drillers from Oklahoma City Dodgers. August 11, 2015 SS Ronald Torreyes assigned to Oklahoma City Dodgers from Tulsa Drillers. June 15, 2015 Tulsa Drillers activated SS Ronald Torreyes. June 12, 2015 Toronto Blue Jays traded SS Ronald Torreyes to Los Angeles Dodgers for cash. June 12, 2015 Los Angeles Dodgers optioned SS Ronald Torreyes to Tulsa Drillers. May 15, 2015 Houston Astros traded SS Ronald Torreyes to Toronto Blue Jays for cash. May 15, 2015 Toronto Blue Jays optioned SS Ronald Torreyes to New Hampshire Fisher Cats. May 7, 2015 Houston Astros designated 2B Ronald Torreyes for assignment. March 16, 2015 Houston Astros optioned 2B Ronald Torreyes to Fresno Grizzlies. November 20, 2014 Houston Astros selected the contract of Ronald Torreyes from Fresno Grizzlies. April 2, 2014 Ronald Torreyes assigned to Oklahoma City RedHawks from Corpus Christi Hooks. January 14, 2014 Houston Astros invited non-roster 2B Ronald Torreyes to spring training. July 22, 2013 Corpus Christi Hooks activated SS Ronald Torreyes from the temporarily inactive list. July 8, 2013 Corpus Christi Hooks placed 2B Ronald Torreyes on the temporarily inactive list. July 3, 2013 2B Ronald Torreyes assigned to Corpus Christi Hooks. July 2, 2013 Chicago Cubs traded 2B Ronald Torreyes to Houston Astros. July 1, 2013 2B Ronald Torreyes roster status changed by Tennessee Smokies. April 3, 2012 Ronald Torreyes assigned to Daytona Cubs from Peoria Chiefs. March 25, 2012 2B Ronald Torreyes assigned to Chicago Cubs. December 23, 2011 Chicago Cubs Traded LHP Sean Marshall to Cincinnati Reds; Cincinnati Reds Traded LHP Travis Wood and CF Dave Sappelt to Chicago Cubs and Dayton Dragons Traded 2B Ronald Torreyes to Peoria Chiefs. March 2, 2011 3B Ronald Torreyes assigned to Cincinnati Reds. September 1, 2010 3B Ronald Torreyes assigned to Dayton Dragons from AZL Reds. August 7, 2010 Ronald Torreyes assigned to AZL Reds from VSL Reds. February 23, 2010 Cincinnati Reds signed free agent 3B Ronald Torreyes to a minor league contract.